BOOTH - Our booth is Booth #5. We are scheduled to be there both days from 8am - 5pm. PARKING – Parking during the Air Show will be in Lot 1. – There is a map and directions on the back of the parking credential. ATTIRE – Concessions attire should be navy, khaki, or black shorts / skorts / capris / or pants with your organization's shirt. Those that do not have organization shirts we ask that you all choose a solid colored, non-logoed shirt. I of course HIGHLY recommend you wear your organization's shirt as it allows the patrons to know who the proceeds benefit. 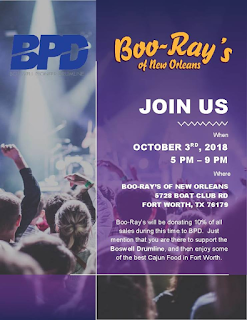 (WE WILL WEAR OUR BPD Tshirts) If you do not have one, please let me know. .
UPSELL – With the economy as it is we need to do our best to upsell. Please make sure your cashiers are the friendliest staff you have, that they greet each customer with a smile, "how may I help you? ", and of course offer an item to go along with that beer or hot dog they ordered. Please also see that they keep the line moving in a timely fashion. TIP JARS – Please make sure you decorate your tip jars and bring them with you! It is very helpful to list your organizations name and what the proceeds benefit. No cut out milk jugs and the like will be allowed. If we believe they are distasteful they will be removed. TIMELINESS – Just a reminder that the times listed on the staff schedule (reattached for ease of reference) are the times that you need to be in the stand ready to go. Please make sure all volunteers account for travel time and such when planning on getting to their stand at a particular time. POS SYSTEM – Our finance and customer service team will assist you with any issues, refunds, and the like, and they can be found on Channel 4. FINANCE AND CUSTOMER SERVICE – With the iPads there are quite a few people you will meet that are on this team: Thomas, Trisha and Jimmy. Please help this department by ensuring your money is always ready as requested in our concession money overview. FOOD & BEVERAGES – Anyone working a four hour shift is entitled to a meal consisting of a sandwich, snack item, and non-alcoholic beverage. In saying that, anyone working is entitled to non-alcoholic beverage but we do ask that you control consumption as if the money was coming out of your pocket. I do believe that is all I have for now! If you have any questions or need anything further at this time please let me now. Thank you to each of you that has volunteered to help this weekend!